Boston attractions, Harvard Square, Cambridge, Boston historic and tourist sites such as Fanueil Hall, Public Garden, Museum of Science, New England Aquarium, Lexington and Concord Historic Sites, Walden Pond, Red Sox, Fenway Park, MIT, Harvard, Tufts, Davis Square in Somerville, Boston College, Boston University, Art Galleries, Newbury Street, Esplanade, Greenway, Minuteman Bikeway, local shops and restaurants, public transportation to Burlington Mall and more. Perfect location for COLLEGE TOURS - near Tufts University - 1 mile, Harvard University 2 miles, Lesley University 2 miles, with 5 to 7 miles of most Boston Colleges including Northeastern, Boston University, Boston College, Emerson, Suffolk University, and more. Just added 21 queen/queen studio suites. Menotomy Grill and Tavern on-site along with a CVS Pharmacy and the Arlington Fitness Center. 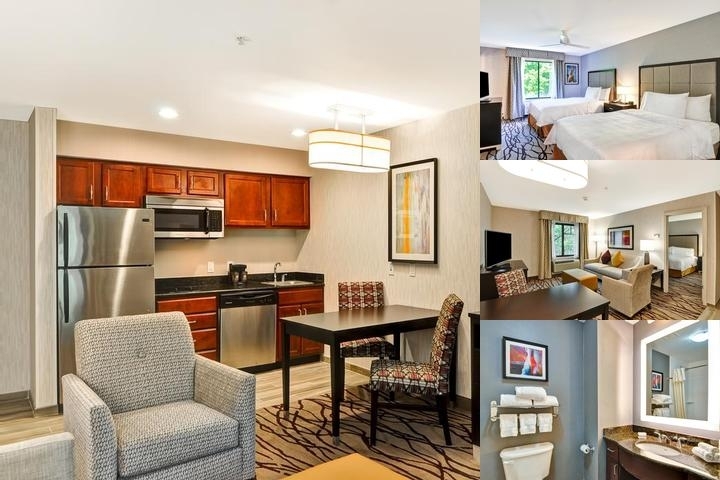 Homewood Suites By Hilton - Boston/Cambridge/Arlington with complimentary covered parking, daily complimentary full hot buffet breakfast! On Cambridge town-line & 2 miles to Harvard Square, 5 miles to Boston! ALL SUITES -all new queen studio, king 1 bedroom & double queen studio suites. Fully-equipped kitchen area including full-sized refrigerator, 2 burner stove-top, microwave, dishwasher, and coffee-maker. Cozy, comfortable parlor area includes 32 " LCD flatscreen television, sofa with fold out double bed. Some King 1 BR Suites with fireplaces. Complimentary high speed internet access, wired or wireless. Bathrooms feature upgraded amenities, marble counter-tops, and tile floors. Located directly on 3 bus lines, #77 travels down Massachusetts Avenue to Davis Sq.,Porter Sq., or Harvard Square, #79 & #350 go to Alewife Train Station for the Redline and connections to MBTA Subway to Boston, #350 is an express bus with service to Burlington Mall and Lahey Clinic area. Hotel is 1 mile from Tufts University, 2 Miles from Harvard Sq./Univ.,near Fenway Park.4 miles to Kendall Square. Social Group cancellations based on 30 days out or less schedule with increasing percentages as proximity to date- increases.Cancel individual reservations 24 hrs. prior to arrival to avoid cancellation fee. We are 6 miles from Logan Airport, taxi fare is $60+ each way. Super Shuttle now in Boston- or Public transportion is available 3 bus lines right outside our doors, bus to train requiring 2 subway changes. Complimentary full buffet breakfast available daily - Mon-Fri 6AM-9AM, Sat -Sun 7AM-10AM includes hot and cold items, varies daily generally including eggs, breakfast potatoes, sausage or bacon or hash, bagels, cream cheese, oatmeal, waffles, various breads, sliced fruit, whole fruit, yogurt, cereal, orange juice and another juice usually cranberry or apple.Evening social - 4 nights a week Mon-Thu from 5PM-7PM - light dining options and non-alcoholic beverages. Complimentary Parking - some covered. Bus parking available with prior notice. complimentary wifi - internet - upgraded capacity available for small charge. 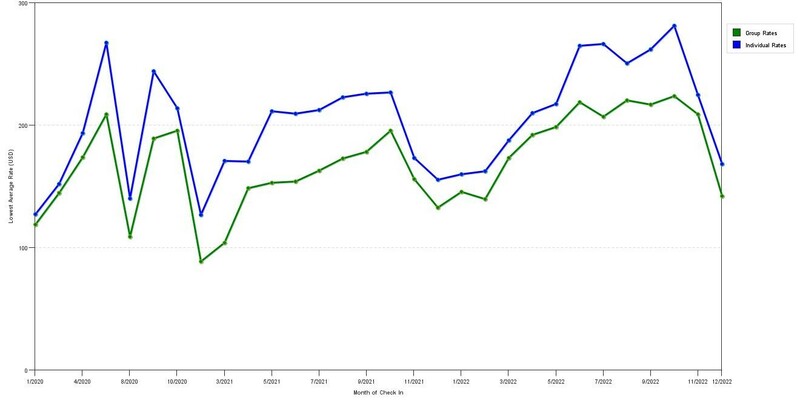 The graph above is seasonality of room rates for both group/meeting quotes and the lowest online individual rates we could find at the time the group/meeting bid was entered. The most competitive group deal shown is 40.4% in May 2017 and the highest average individual rate is $350 in the month of May 2017. This chart will show past seasonality and also project future months. If you are flexible with dates, you may want to consider staying at Homewood Suites by Hilton Boston / Cambridge / Arlington in a month when rates are lower. Below are the meeting, banquet, conference and event spaces at Homewood Suites by Hilton Boston / Cambridge / Arlington. Feel free to use the Homewood Suites by Hilton Boston / Cambridge / Arlington meeting space capacities chart below to help in your event planning. Hotel Planner specializes in Arlington event planning for sleeping rooms and meeting space for corporate events, weddings, parties, conventions, negotiated rates and trade shows.